Logan Rushing, Whiskey Curator for the Stanley Hotel, discusses geography with Sean Gaughan of Big Paddy. "We're beginning in the North Orkney Islands," he said as he poured. Geography, we're about to learn, has a lot to do with flavor. Over the next few hours, we made our way down the coast of Scotland, across to Japan and, when we switched to bourbons, Kentucky. I looked across all the glassware at Sean Gaughan, my whiskey-tasting partner for the night and longtime fellow adventurer. About every two years, Sean and I take some kind of trip, away from homes and families. It's a rare, brief break away from busy lives, and it's obvious that that's what we were drinking to. We clinked, sniffed and swallowed. It was a warm, earthy burn, and we took a moment to let it settle. The Stanley's whiskey collection has more than 1,200 "expressions" from which to choose -- it was once the largest selection in the state -- but I'd never seen it up close. It was Sean's first time as well, even though he plays in an Irish rock band called Big Paddy, whose tagline used to be, "jigs, reels, and songs about whiskey" (now it's simply "Big Paddy Irish Rock"). Cascade, in the Stanley Hotel in Estes Park, is home to a collection of more than 1,200 bottles of whiskey at last count. Logan swung a bottle of Macallan Rare Cask onto the table, and we began discussing things like peat, heather, moss and sherry casks. Anyone can sample the wares; visitors can drop in anytime for a flight of three whiskeys. 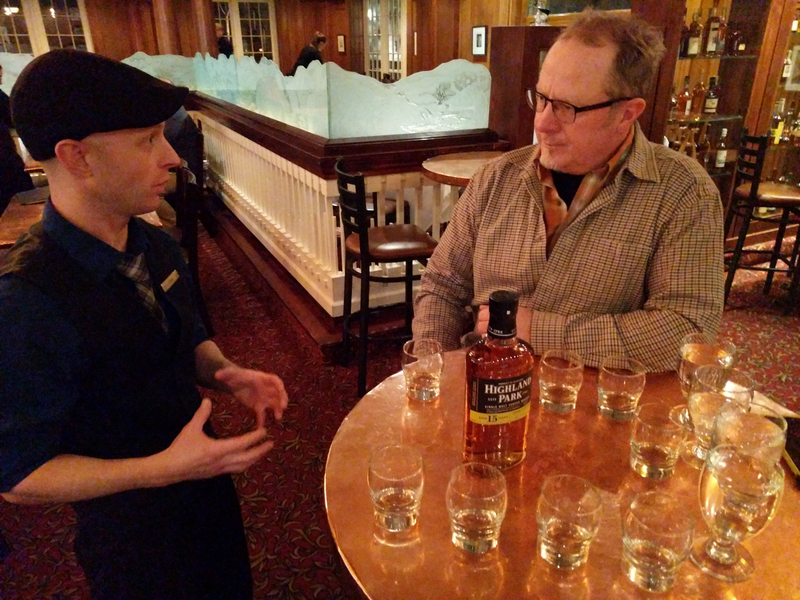 Our guided whiskey tasting was part of a customized version of the Stanley Hotel's "culinary journey winter package for foodies." We also had a night in the Aspire Residences (40 rooms and suites the hotel built and soft-opened last summer -- they're still completing the spa), a guided Sunday morning hike with Kent Mountaineering and two seats at Table, the pop-up, five-course dinner club the Stanley offers every weekend that features a rotation of renowned Colorado chefs and wineries. That's where we began, a few hours before coming to Whiskeytown: in front of a fireplace, sipping wine with 22 strangers, then sitting together with them around a long wooden table. On this evening, Chef Ted Schneider of Moe's BBQ in Fort Collins took over the kitchen, pairing dishes like crispy pork belly and fruitwood-smoked duck with small-batch wines from Lost Prairie Winery, also out of Old Town Fort Collins. Our palates sufficiently warmed, Sean and I then walked over to the hotel bar to meet up with our whiskey guide. "You're going to notice some sandalwood and cedar notes, followed by tropical mango," Logan said of the Bowmore Islay whiskey swirling in our glasses. "It was aged in Mizunara Japanese oak casks, which is very unique. You'll notice a bit of floral spice and smoke on the finish." This time, as my friend and I raised another glass, no toast was needed, just a pause--and a shared, knowing nod--before the night continued. If you go: Whiskey flights -- three .75-ounce pours -- start from $18-$25. Cascade (the bar inside the Stanley) is open 11 a.m. to close daily. 970-577-4001 or stanleyhotel.com. Outdoor Winter Adventure Packages: The Stanley Hot is partnering with longtime local outfitter Kent Mountain Adventure Center to offer guests a variety of customized guided trips, both in Rocky Mountain National Park and the surrounding National Forest. Guests choose from ice climbing, back country skiing (AT Setup), snow-shoeing, and cross-country skiing trips, as well as a half-day "Intro to Avalanche Awareness" class, for those who'd like to learn more about being safe in the winter months. As an example, their "couples backcountry package" includes guided cross country or snowshoeing for two, gear rental, two-night hotel stay, and Table dinner for two.